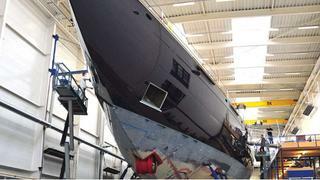 A 6m centreboard will run underneath Athosës hull. It is designed to break or collapse on impact, in the interests of safety. 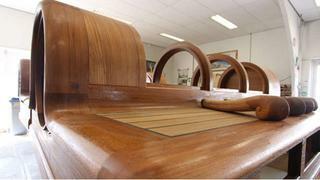 The raised and fielded panelling promises much for a classic interior designed entirely by Andre Hoek and his team. Athos also features a fully integrated stern anchor. Again, it is not the anchor itself that is revolutionary but the way it is being operated – in this case remotely, with a uniquely devised system that retracts, rotates and pivots the anchor into the hull. ‘The logistics of implementing this pushbutton-controlled installation within the framework and layout of the stern were phenomenal,’ adds Zijlmans. The arrangement of the main anchors is unique. Normally these are integrated into an aluminium hull and then the area around the anchor opening is clad in stainless steel plates. Another fascinating feature incorporated into Athos’ giant hull is her hydraulically operated centreboard, which is seriously complex both from a structural point of view and technically. From the earliest stage, the yacht’s single rudder and keel centreboard configuration was designed to minimise the wetted surface and enhance performance. The huge 6m centreboard construction itself was designed in order to offer an unparalleled degree of safety. The bottom two metres are fitted on to the top part with a snap-bolt construction and the board has an indirect connection to the hydrocylinder. Should the board hit something, the mechanism will take the breaking load by deforming or breaking and the cylinder will not be affected. Walking around the giant hull in a construction hall it is easy to forget that structures of a similar standard of sophistication and an even greater magnitude will soon be sprouting out of the deck. Rondal has been responsible for building the giant masts, which are made of high modulus carbon fibre in order to minimise weight. Further significant weight savings have been realised by replacing the heavy stainless steel cylinder boomvangs normally found on a yacht of this size with two carbon vangs tailor-made by Navtec. Weight issues were also a key reason to use PBO standing rigging instead of rods. This was created by Smart Rigging, which had to engineer and manufacture the longest cables thus far made for a pleasure vessel. The records keep on tumbling as we explore Athos’ spars. Being a Panamax boat she has a very tall sail plan for a schooner. At 61m, the main mast is the longest mast built by Rondal or anyone else in The Netherlands. The 15m fore boom and 23.5m main boom are made of a high strength carbon fibre sandwich construction. Each has an electric sun awning system on both sides and over the full boom length, custom designed by Rondal. Meanwhile, the main boom is the longest built by the company so far, even larger than the boom for Athena. In terms of its operation, Athos has an entirely pushbutton-operated rig that includes in-boom furling sails, hydraulic boom vangs and captive winches for the sheets and halyards. ‘When we first designed Athos, she was intended to be an ocean-going cruising yacht,’ recalls Hoek. ‘But after the owner started enjoying racing he decided to increase the emphasis on performance.